Although Thomas Edison’s research of rubber plants ended long ago, the plants on his estate still assist others around the world with their botanical research. Our plants are inventoried regularly by the Plant Curator and then included in the Botanic Gardens Conservation International (BGCI) PlantSearch database, the only global database of plant species in botanic gardens and formal institutions. The database allows researchers to contact gardens holding specific plants and request material. 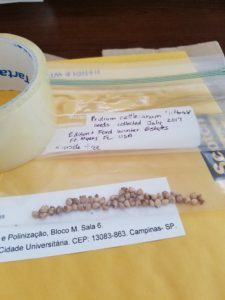 For example, in November 2016, a PhD student from the University of Campinas in Brazil contacted our Plant Curator via the BGCI database and requested seeds from strawberry guava, Psidium cattleianum ‘littorale’. In July 2017, we mailed approximately 50 seeds from two of our guava trees to the PhD student. She will use the seeds for a genetic study and update us with results when her work is completed. Edison Ford is proud to participate in the BGCI program and will continue to provide plant materials to researchers when possible.